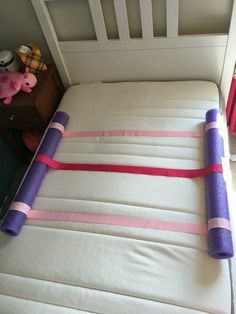 Can anyone please tell me in which shop I could find a bed guard, for a toddlers bed? You could try putting a pool noodle under the fitted sheet. It would help prevent them from rolling out of bed by accident. It's soft so they are less likely to wake up if they roll into it, and they can crawl over it if needed when awake. I think it very much depends on the child's size, age, and sleeping habits. Multiple friends of mine used pool noodles from age 2 without problems and the kids never went over the edge. If you have a particularly active sleeper, you can rig up multiple noodles instead of using just one. Like this. OP is searching for a proper bed guard, so of course this is only if they don't find what they want or if they want to have some fun. This is the one we have. All others are much shorter than this one. This can be harnessed around the bed-frame, below the mattress. Really secure. Do look on other websites for a better price. We got ours from "Baby One" .